The Moon is in Scorpio until 10:13 AM. The Moon is void from 9:54 AM to 10:13 AM. 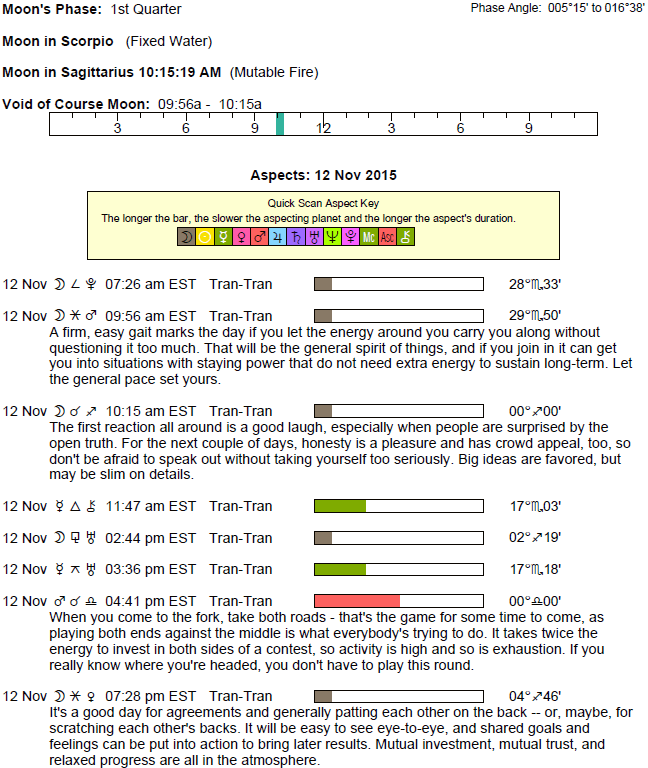 The Moon is in Sagittarius from 10:13 AM forward (until Saturday, November 14th, at 7:21 PM). 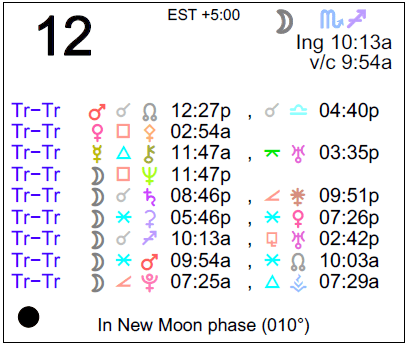 A New Moon occurred yesterday, and a First Quarter Moon will occur on November 19th. Mars enters Libra today (Mars transits Libra from November 12th to January 3rd). This is a good time to tackle inner demons, dear Aries, which seem far more manageable right now! A conversation can lead to an emotional breakthrough, and it’s not necessarily about being eloquent or choosing the perfect words – it’s more about the ability to read intentions. 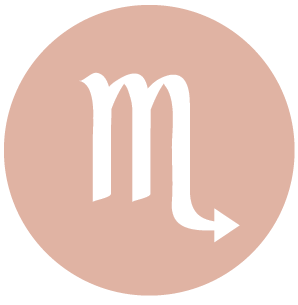 Mars moves into your opposing sign and partnership sector, where it will transit until January 3rd. This cycle is about energy, motivation, and assertiveness, and it puts a strong emphasis on teaming or pairing up in order to get things done. It can also point to an animated time for partnerships and close relationships, and possibly disruptive before things get better. This is because Mars is direct and to the point, and with it moving through a sector of relationships, those things that have been blocked, hidden, or buried may not be tolerated any longer. There may be a competitive feeling in a relationship, or you could seem to need the encouragement of someone to get something done. This is not the ideal position for your fiery ruler energetically speaking, as you might often feel as if the ball is in another’s court. However, this can also be a time for taking a break from making all the decisions and you may very well need this now. 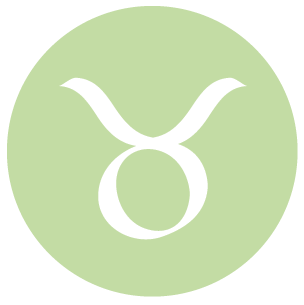 There is more willingness to look at matters honestly today, dear Taurus, particularly in relationships. Good conversations can transpire with this attitude. Intimacy grows now, or you end up learning some important things through your interactions. With fiery, confident, competitive Mars entering your work and health sector today, you are beginning a cycle in which you bring more confidence, action, and courage to your work and/or to your health routines. This influence continues into the new year, until January 3rd. If your work or daily life can use a boost or if you could benefit from increased motivation or courage in these areas, this is a great cycle. There can be more competitiveness in or at your work, and this can be motivating or frustrating. If it’s possible to work independently, it can help. You might also need extra stimulation now, or you may want to pioneer something or go your own way with the work you do or the health programs you take on. 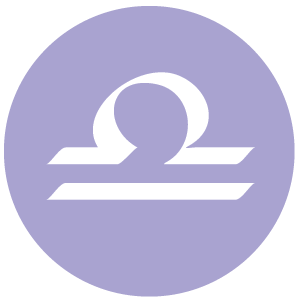 Your ruler, Mercury, gathers support from wise and caring Chiron today, dear Gemini, and this enhances your confidence, as well as others’ confidence in you. Problem solving skills are strong. You can be especially wise right now, particularly about where you’re headed in your work or with your projects. It might be a good time for communicating with co-workers or bosses. Also today, dynamic, energetic Mars enters your solar fifth house, where it will transit until January 3rd. This is the beginning of an energetic, stimulating time, particularly for competitive activities, romance, and creative pursuits. This transit can support your efforts to pursue your heart’s desire, particularly if you have been needing more courage to confidently go after what you want. When Mars is challenged during this transit, there could be impatience or some jealousy to deal with. Nevertheless, this rather outgoing cycle brings smoother energy to most of your endeavors, as your direct approach tends to get you results. Conversations with a partner, romantic interest, and children can be especially growth-oriented and possibly on some level, quite healing, dear Cancer. This continues a theme from two days ago – there can be some breakthroughs of understanding. If you need to discuss matters that may be considered complicated, this is a time for doing so, as others are more willing to look beyond the surface of things and to make an attempt to understand the more subtle elements of life. Fiery Mars enters your home and family sector today, where it will transit until January 3rd. This can bring quite a bit of animation, energy, and dynamism to your home environment, personal life, and family relationships. Things can be stirred up now, so prepare for that, but what’s coming of this is a more direct approach to problem areas and some form of resolution. You can be more protective of others and of yourself during this cycle, but do watch for touchiness or defensiveness, which isn’t quite as productive. You can feel especially good about recent “repairs” or other forms of strengthening in terms of bonding with family or in your relationship with yourself, dear Leo. This is a good time for connecting on a deep level and for enjoying comforting, comfortable relationships and conversations or other meaningful exchanges. You could receive the backing you need for a project. As well today, fiery Mars enters your communications sector, where it will transit until January 3rd. This can be a wonderful cycle in which to get going on important projects, study, and teach, although there could be some need to watch for impatience in your communications. There can be great passion experiences for your ideas, plans, and projects, but not always a willingness to team up or work with others, largely because you tend to want to work at your own pace. New interests and contacts can emerge now, or you can find renewed motivation to pursue subjects that have dropped off the radar. Your wit and personality are admired now, dear Virgo, and you’re in a cooperative frame of mind. Your advice or comforting words can be in demand and appreciated. This is a good day for almost any kind of social or relationship matter. 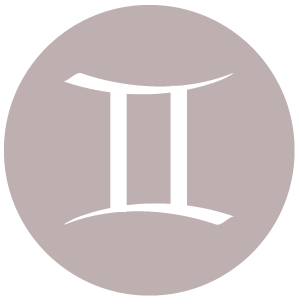 With Mars moving out of your sign and into Libra today, you’ll begin to feel some of the pressures to action subsiding. Impatience and impulsiveness are leaving you, and much of your energy will be directed into business endeavors and the seeking out of material security. The drive to improve your resources is strong, but there can also be some tensions surrounding personal finances and possessions when Mars is challenged during this transit that lasts until January 3rd, 2016. It’s a strong time to recognize a need to take charge of your personal possessions and money matters. You could be motivated to make more money, although some of you could be a little impulsive with purchases during this period. This can also be a time for working on building a business or putting a natural talent to good use. 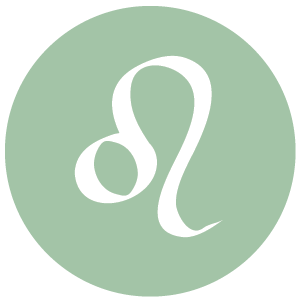 You can feel in tune with the people around you today, dear Libra, particularly family members, but with most others as well. There is willingness to cooperate, which is always welcome in your Libra book, and a sense that you’re going somewhere in your conversations. 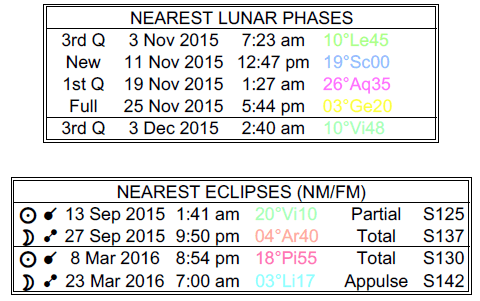 As well today, Mars enters your sign, where it will transit until January 3rd, 2016. This is an energizing, courageous, and fiery position, although it can sometimes be impatient and combative as you may not always know what to do with excess energy! Managed well, this can be a wonderful time for going after what you want directly and straightforwardly. You are more decisive and assertive now. You are clearer about what you’d like to do. Partners may be on the same page as you, as Mars rules your partnership sector and is now in your sign. In your haste, try not to trip over yourself or others! Pace yourself, but take action on things that matter to you most. This is a potentially superb day for communications-related matters, dear Scorpio. It’s a good time to make a presentation, pitch an idea, promote yourself or your work, or simply to have a conversation that is meaningful to you. It’s an especially strong time for making plans and devising strategies. Later today, Mars enters the sign behind yours, where it will transit until January 3rd. This sets up an interesting dynamic, since you have the Sun and Mercury in your sign, promoting your wishes and giving you more visibility. With Mars under cover, you begin to do a lot behind the scenes. There can be more attention to projects or even relationships that have run their course or that need to change significantly before you move forward. You may not be as clear or confident about your next step, but this apparent slowdown is in fact a strong time for recharging your batteries, putting bad situations behind you, and reassessing certain projects and plans. 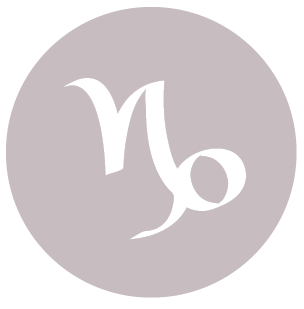 While the Moon’s move into your sign this morning can be energizing, dear Sagittarius, you’re also inclined to some deep thought. You might experience a purging or healing moment as you see a previously baffling situation more clearly. Writing in a journal or privately in some way can be an urge, and quite helpful as well. Some of the immediate pressure and competitive feelings surrounding your work and responsibilities can subside now as assertive Mars moves out of your career and reputation sector. You’re still rather goal-oriented going forward, but the pressure on yourself or from others to perform decreases. Mars now moves into your sector of wishes, hopes, aspirations, ideals, community, friends, and groups. It’s a time for taking the initiative socially or for working towards cherished causes. This cycle continues until a few days into the new year, until January 3rd, 2016. Your social life can be quite animated during this period. 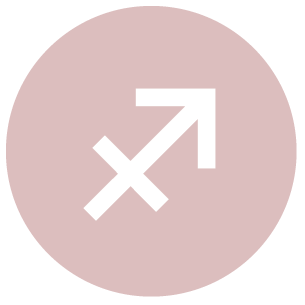 Overall, it’s a pleasing transit as Mars is now moving in harmony with your sign, which tends to point to a natural flow of energy and support for your actions. 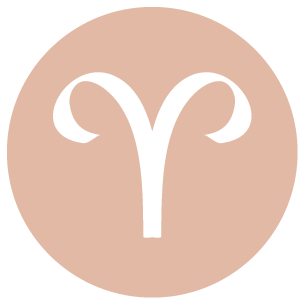 Others might notice both your wisdom and compassion today, dear Capricorn. You are at your best when others are counting on you and showing their respect for you, which may very well be happening today. There may be new insight into a friendship or long-term plan/project. Conversations can be affirming. Also today, Mars moves into your reputation and career sector, and will energize and animate this sector of your solar chart until January 3rd. This can awaken ambitions and a competitive spirit. The desire or need to take charge of your life, as well as for a solid plan, can take hold now. It’s true that this cycle sometimes stimulates conflicts, particularly with authority figures, it’s also a time of more courage and drive to improve, perform, and excel. You’re likely to have less patience for dilly-dallying now, and more energy for making things happen. This is a good day for projecting yourself in a humble yet confident way, dear Aquarius, and for some sound advice as well. 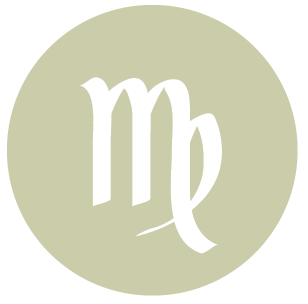 There may be some need to watch for off the cuff remarks with Mercury in a very accountable part of your chart giving your communications more visibility and/or impact, in awkward angle to your ruler, Uranus, which can be a little erratic or rebellious, in your communications sector. However, for the most part, there is greater understanding now, and it’s quite likely people can read your noble intentions! 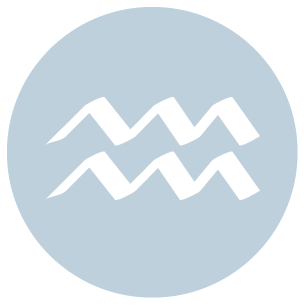 The image you are projecting is more strongly tied with success these days with both the Sun and Mercury at the top of your solar chart, so you may as well pay some attention to it. Also today, fiery Mars enters fellow Air sign Libra, where it will transit until January 3rd. This is a wonderful transit when your efforts and actions tend to be supported by others and by the universe. You begin to feel energized, more positive, and enthusiastic during this cycle. If it pleases you, you can motivate and inspire others to take action on some matter, but you are also quite content to do your own thing. 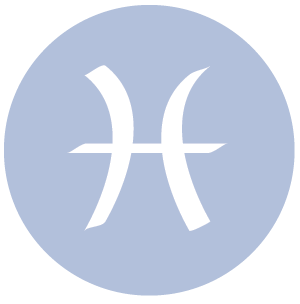 Chiron in your sign asks you to be true to yourself, dear Pisces, and Mercury, the planet of communication, assists you in this process today. This provides a wonderful opportunity to express yourself authentically and to connect with others when it comes to partnering, negotiating, higher beliefs, education, and the sharing of ideas. Also today, Mars enters your intimacy sector, where this planet of courage and action will transit until January 3rd, 2016. This can be a wonderful time for taking action in your intimate life, for pursuing your desires, and for reaching out to others for support or assistance, financially or emotionally. This cycle turns the heat up on the more intricate elements of relating. It can also be a powerful period for throwing your energy into an important project, research, or investigation. You can be quite motivated and energized by a pet project or cause that absorbs your attention during this period. It’s also a good time for long-term planning and strategy. Interpersonal conflicts are possible now if there have been tricky power dynamics in a partnership, but this can put you a step or two closer to resolution. 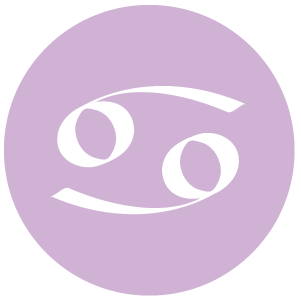 If Your Birthday is November 12th, If Today is Your Birthday full horoscope here. Right now you need to display diplomacy and justice, and a strong creative urge. Be wary of indecision. Moon 22° Sagittarius 04' 25"
Mercury 08° Aries 03' 03"